In September I spent a few fantastic days in Paris, a place I haven't been back to in around 10 years. Unfortunately what I discovered was that the food sucked. Alain Ducasse's three-michelin starred restaurant Le Meurice left my stomach (and my wallet) wanting. The locally-celebrated L'Ami Jean was nothing to write home about. And even my cousin's recommendation of delicious roast chicken at Le Coq Rico was good - but not spectacular. The only exception to this was La Tour d'Argent (meaning the Silver Tower) - an antiquated restaurant specialising in duck, with an extraordinary heritage dating back to 1582 (according to the restaurant). We arrived five minutes early and were led to a sitting room showcasing antique plates, metal figurines, handwritten letters dating back to 1914 and metal teapots. With a fireplace, grand stuffed chairs, and vintage carpet, the room was a reminder of the rich cultural lineage of France. 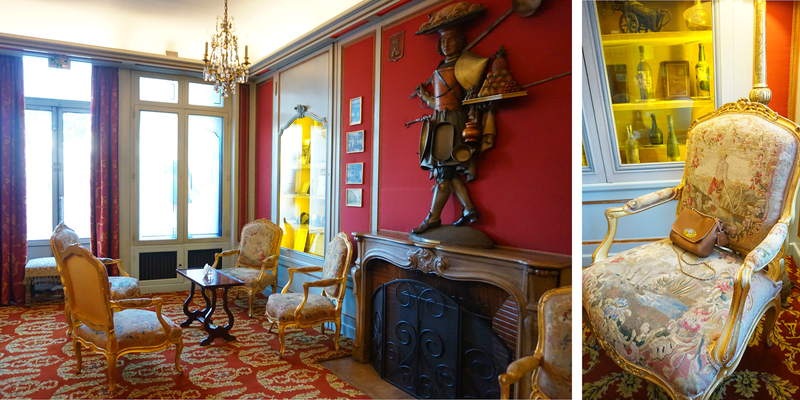 The sitting room at La Tour D'Argent, full of antiques in glass cabinets. A waiter with a coat tail offered us apértifs before we were taken down a hallway full of photos and signatures from celebrities who had visited (including Claudia Schiffer in 1994, John Travolta, Angelina Jolie, Bill Clinton, Henry Kissinger, David Rockefeller and JFK) and up an elevator to the restaurant. Beautiful panoramic views of the sun gently setting over Notre Dam Cathedral and the adjacent Seine River greeted us. Notre Dam Cathedral is on the left, and the Seine River is directly opposite the restaurant. The dining room at La Tour d'Argent is renowned - royal blue carpets with gold pattern finishings and wooden panels on the wall make the restaurant feel opulent, in a very old fashioned way. Waiters with long coat tails, freshly starched shirts and black bowties lit the long candles on our table that were elegantly placed next to glass Lalique duck table weights and flowers, and we were provided with menus (with prices for me, and without prices for my mother - thanks guys). The wine list (or should I say, encyclopedia) was also the most extensive I have ever seen, with over 15,000 wines from all over the world, clearly marked with tabs along the edge. Feeling somewhat overwhelmed, I picked one of the most basic French wines, at a cost of 21 euros. The wine list. Or should I say, encyclopedia. As the set menus were only allowed if the whole table orders them (and I wasn't feeling too hungry), we opted for the seasonal duck with roasted duck juice, figs and blackcurrent. Duck is the must-have dish at La Tour d'Argent, where they are sourced from House Burguad, and each duck is given a number. Before our mains arrived, we were given complimentary amuse-bouche of anchovies and eggplant, which had the perfect balance of textures between the crunch of the croutons and the softness of the chopped tomatoes and herbs. Amuse-bouche of anchovies and eggplant topped with croutons, tomatoes and herbs. 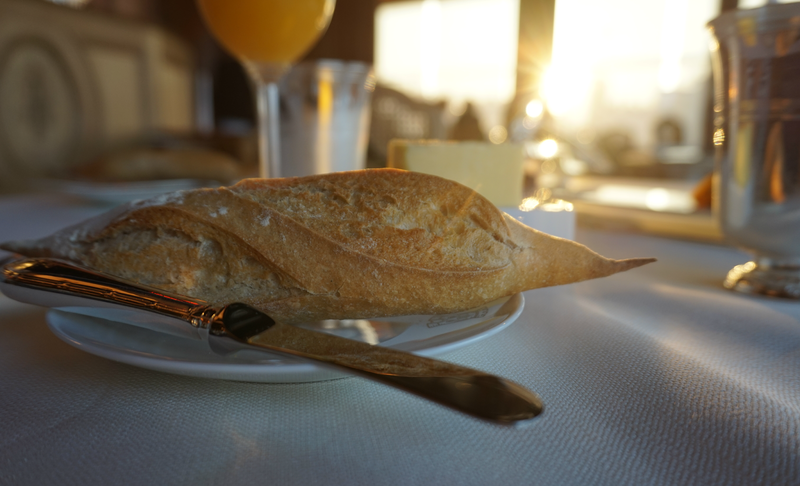 Following this, the freshly baked French baguettes arrived at our table. I have no idea how the French do it, but this had the perfect crispy exterior combined with tender fluffy bread on the inside, with the classic contouring of the baguette shape. Having said that, the flavour was slightly disappointing - it was mild and not buttery, the way I love my pastries. Beautifully contoured French baguette (but sadly without the buttery flavour!). The roasted duck is served in two portions: first the breast, which was slightly overcooked (as I had ordered medium) but compensated by the blueberry and fig infused duck juice with a hint of licorice. The duck itself had a nice amount of fat to it, which ensured it didn't taste overly dry. Along with the duck came a side of air-blown potato chips, which were light and airy and had the flavour of wedges, but without the potato stuffing inside. Duck breast with blueberry and fig infused duck juice. I don't like chips but these were pretty mind-blowing. Air-blown chips with the flavour of wedges but without the potato stuffing. Then came the panfried, sauteed duck leg topped with a salad sprinkled in balsamic vinegar. The duck was tender and full of meaty flavour, and the structure pleasantly reminded us of chicken. Tender and flavourful duck leg topped with salad and balsamic vinegar. Having been born to (and taking after) a mother with a sweet tooth, we both ordered dessert. She picked the souffle with praline and chocolate, which was light and fluffy, without any signs of sagging - and piping hot, the way a good souffle should be. It came with a pistachio semifreddo that was creamier and smoother than usual. Being a chocolate dessert girl, I had the chocolate tart with dark chocolate ice cream and delicate butterscotch roll with chocolate brittle. While the roll and brittle were done well, the dark chocolate icecream was somewhat overpowering, leaving me with a slightly bitter sensation in my mouth that hid the flavours of the tart. Chocolate tart with dark chocolate icecream, butterscotch roll and chocolate brittle. 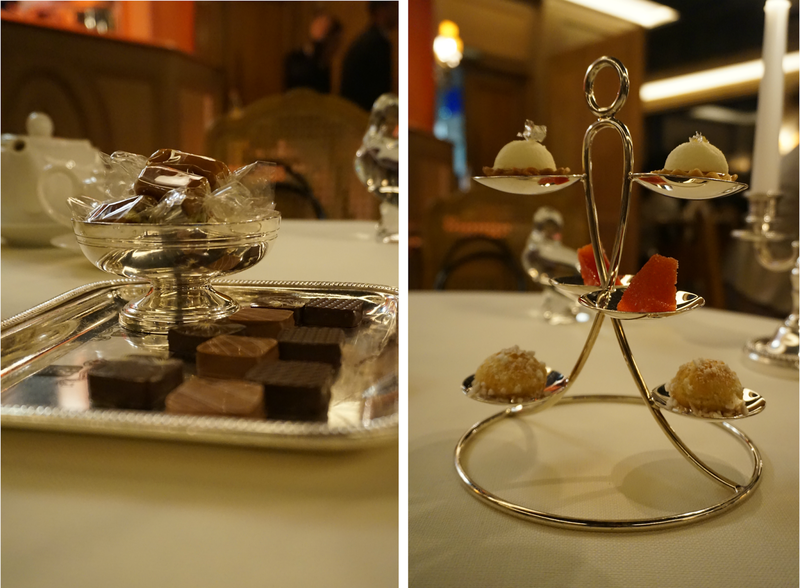 The excellent petit fours made up for my rather unimpressive dessert: light profiteroles with cream custard and sugar rocks on the outside, silky chocolates that melted in our mouths, classic French fruit jelly pastilles, tarts, and toffees that were deliciously smooth. You may remember I mentioned that each duck is given a number - at the end of our meal, we were given a postcard with the number of our duck on it (#1135384), as well as a small parting gift of cake. A set dinner will set you back 200 euros (or 180 euros if you pick the "chef's choice" set), which comes with foie gras, lobster bisque, duck with orange sauce, cheese, and a chocolate tart. The seasonal duck we ordered cost 70 euros per person, the chocolate tart was 32 euros, the souffle 34 euros, water was 8 euros, tea 10 euros, and a freshly squeezed orange juice 14 euros (!). The total for two people came to 269 euros including TVA. You may wonder why I have been so enthusiastic about La Tour d'Argent, despite not being overindulgent in my praise of the food. One of the key reasons is that while the food was good, the service was impeccable. Although it was somewhat confusing for us to be served by different people for different needs (i.e. a sommelier, a waiter who took our mains order, another who came over to explain the history behind the duck, and another who assisted us with dessert), they were all very professional, helpful and efficient - and unlike some staff at other luxury French restaurants (I'm looking at you, Le Meurice!) they never made us feel like we were out of place or had ordered too little. Although France is not short of great restaurants (apparently!) 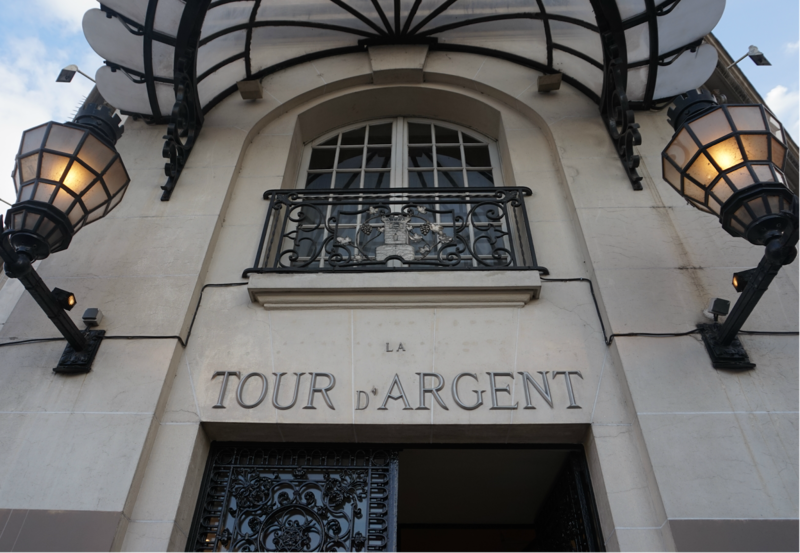 I would recommend La Tour D'Argent if you're after a decent meal in a beautiful, traditional setting, with superb service. Order the duck, obviously. Do not order the fresh orange juice (14 euros), obviously. The restaurant requires you to provide a 200 euro deposit upon booking - which means if you make a reservation, be careful of their cancellation policy!